As he had done many times in recent years, Jimmie Foxx chose to spend the afternoon of July 21, 1967, with his younger brother, Sam. The two men lived close by one another in Miami, and often got together to reminisce about the elder Foxx’s legendary baseball career, in which he slugged 534 home runs, won three MVP awards, and was elected to the Hall of Fame. During dinner, Jimmie Foxx collapsed with an apparent heart attack (he had suffered two others in recent years) and was rushed to Miami Baptist Hospital, where attempts to revive him failed. An autopsy later revealed that Foxx had choked to death, in a fashion similar to that of his wife several months earlier. Broken-hearted, Sam Foxx died just a few weeks later. The sad end to Foxx’s life does not diminish what is in many ways a classic American story. He rose from a Maryland farm boy who came from little to reach the heights of fame, and fell back to earth again. However, throughout it all he was able to retain the personality and appeal that still drew praise from his former teammates long after they played with him. In 1924 the expansion of the Eastern Shore League brought a team to nearby Easton, Maryland. The franchise attracted additional attention due to its player-manager, Frank “Home Run” Baker, a future Hall of Famer and local hero from Trappe, Maryland. Foxx’s baseball exploits for Sudlersville High quickly came to Baker’s attention, and he invited Foxx for a tryout. Showing up in a pair of overalls, the high school junior told Baker he could catch for him if he needed him to do so, and was signed for a salary estimated at between $125 and $250 a month. At the end of July, the Philadelphia Athletics purchased his contract, and he even went up to the big club to watch the end of the regular season from the bench. After the season, he returned to Sudlersville and his senior year of high school—after all, the young slugger was only 16! The schoolboy athlete did not finish that senior year, leaving in the winter to attend spring training with the Athletics. Foxx stuck with the team as a pinch hitter and reserve catcher, singling in his major-league debut against Washington’s Vean Gregg on May 1, 1925. The team already had a gifted young catcher in Mickey Cochrane, which relegated Foxx to pinch-hitting and spot duty in the outfield. By 1927 Connie Mack was beginning to build a powerhouse. The Ruth/Gehrig Yankees still reigned supreme, and the Athletics were only able to finish a distant second that season. Mack had carefully acquired younger players such as Foxx, Cochrane, pitcher Lefty Grove, and outfielder Al Simmons, and brought in veterans Ty Cobb (in 1927) and Tris Speaker (in 1928) to provide experience and guidance to his youthful stars. In 1929 the Athletics blossomed into a legendary juggernaut, romping to an easy pennant, finishing 18 games ahead of the Yankees. Foxx, playing mostly at first base now, had his first wonderful season. Throughout August, he was leading the league in hitting at .390 and running neck-and-neck with Ruth and Gehrig for the lead in home runs. In 1940, Foxx finished the season with a .335 average and 37 home runs, and was one of four A’s players to have an on-base percentage over .420. The 1930 World Series pitted the A’s against the St. Louis Cardinals, and they battled to a 2-2 tie going into Game Five at Sportsman’s Park. The game was scoreless into the top of the ninth inning. With one on, Foxx announced to his teammates that he would “bust up the game right now”. He then proceeded to hit a Burleigh Grimes pitch in the left-center-field bleachers, giving the A’s the win and providing the impetus for them to wrap up the Series in Game Six. The game-winning home run gave Foxx one of his proudest moments and he later cited the blow as one of the greatest moments of his career. In his three postseason appearances, Foxx hit .344 with four home runs. However, the 1931 World Series was the last one for Foxx and the Philadelphia Athletics. The Athletics eroded but again Foxx provided them with most of their season’s highlights. In 1934, for the third straight year, he hit over 40 home runs, and even stole a career high 11 bases. The powerful slugger caught the eye of Tom Yawkey and was one of the new owner's first big acquisitions in Boston. When the Great Depression fully hit in the early 1930s, A's owner Connie Mack was unable to pay the salaries of his highly paid stars, and was obliged to sell off a number of them. Tom Yawkey, who had already purchased Grove from Philadelphia and player-manager Joe Cronin from Washington in recent years, paid Mack $150,000 for Foxx and pitcher Johnny Marcum (two minor players, Gordon Rhodes and George Salvino were also included in the deal). Foxx reacted positively to the deal, no doubt helped by a $7,000 increase in salary. The highlight of Foxx’s first season in Boston came on June 16, 1936 when he hit a ball completely out of Comiskey Park. (In later years, pitchers Lefty Gomez and Ted Lyons enjoyed spinning yarns about the tape measure shots Foxx hit off them.) This was one of 41 home runs that season, and although he did not lead the league in any of the power categories, Foxx’s performance was one of the bright spots of a disappointing season for the Red Sox. Although he topped his Comiskey Park blast by hitting a ball out of Fenway Park to the right of the center field flagpole against the Yankees on August 12, 1937 speculation began that his career was on the downslide. In 1938, Foxx silenced his critics with one of his greatest seasons. He proved that his power had not diminished by hitting five home runs in the last week of the exhibition season. In May, he hit 10 home runs and drove in a whopping 35 runs. Other highlights followed, including a game on June 16 in which he was walked six times, tying a major league record. The Yankees eclipsed the Red Sox in the standings, and Foxx’s home run totals came in second to Hank Greenberg’s run at Ruth’s record. Still, when the dust had settled over the 1938 season, Foxx had won two-thirds of another Triple Crown, batting .349 and driving in 175 runs, the fourth highest total all time. Thirty five of Foxx’s 50 home runs were hit at friendly Fenway Park, establishing what was then a record for homers hit at home. His RBI totals still stand as a Boston Red Sox team record, and his home run total was not surpassed by a Red Sox player until David Ortiz in the 2006 season. After the season, Foxx beat out Greenberg in the voting to take home his third American League MVP award. The 1939 season brought a new star to the Red Sox, a raw rookie named Theodore Samuel Williams. Williams had boasted to his new teammates, “Wait until Foxx sees me hit!”- but he also looked to the veteran slugger as a mentor and even a father figure. In later years, Williams told his younger teammates stories about Foxx’s slugging, and pointed out places in ballparks where Foxx had hit tape-measure home runs. The friendship between the two men lasted until the end of Foxx’s life, and Ted remained close to his teammates’ family until his own death in 2002. Together the two sluggers formed a powerful left/right combo that brought the Red Sox into pennant contention for most of the 1939 season. Foxx enjoyed another superb season, batting .360, second in the league, and leading the AL with 35 home runs. His great year concluded a remarkable decade in which he was arguably the game’s dominant hitter. From 1930 through1939, Foxx slugged 415 home runs and drove in 1,403 runs. Foxx remained an all-star slugger in 1940 and 1941, driving in over 100 runs both years and hitting a total of 55 home runs. His triple allowed longtime teammate Lefty Grove to win his 300th game in 1941. Foxx had been eclipsed by Williams as the team’s star and was showing signs of slowing at the plate and in the field. His sinus problem became more acute, and he began to wear eyeglasses off the field to combat a decline in his vision. In addition, he grew more critical of player-manager Joe Cronin. Although Foxx got along well with everybody, he never had the respect for Cronin that he had for Mack, and some tension developed (to his credit, Cronin interceded in Foxx’s life in later years with offers of employment and financial assistance). When the 1941 season ended, it was no secret that Foxx’s days with the Red Sox were coming to an end. 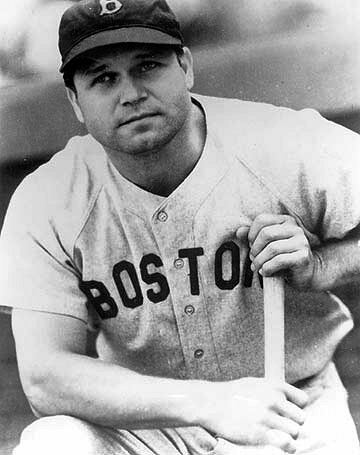 During seven seasons with the Red Sox, Foxx captured a home run title, an RBI crown, a batting title, and set a still-standing franchise record for RBI in a single season with 175. Foxx hit for both average and power like few before or since. His .349 average won the AL batting crown in 1938, and he ranked first in both on-base percentage and slugging in '38 and '39. His career total of 534 home runs was, for decades, second only to Babe Ruth. Foxx was voted into the National Baseball Hall of Fame in 1951. Foxx was one of the three or four most feared sluggers of his era. The great Yankee pitcher Lefty Gomez once said of him, "He has muscles in his hair." In 1937, Foxx hit a ball into the third deck of the left-field stands at Yankee Stadium in New York, a very rare feat because of the distance and the angle of the stands. Gomez was the pitcher who gave it up, and when asked how far it went, he said, "I don't know, but I do know it took somebody 45 minutes to go up there and get it back." In the discussion of history's most powerful right-handed hitters, Jimmie Foxx's name must be included. Foxx collected three home run titles, two RBI crowns, and one batting title with his first team (not to mention a Triple Crown in 1933 with a batting average of .356, 163 RBIs, and 48 home runs). He won back-to-back MVP honors in 1932 and 1933.